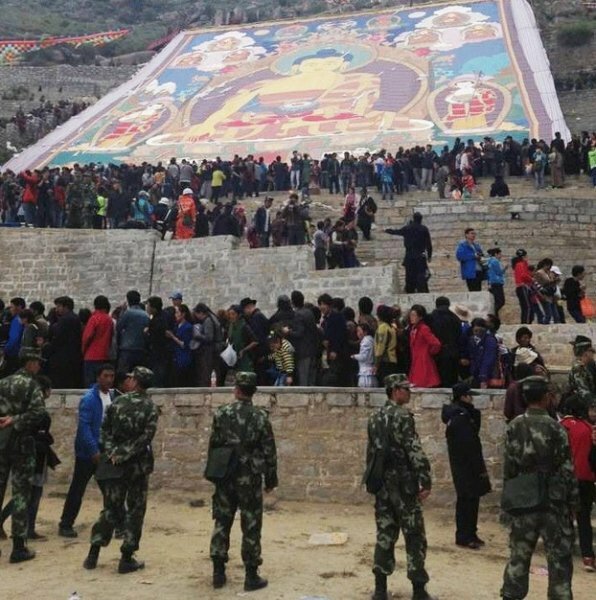 Chinese authorities deployed 1,000 security personnel at a monastery in the outskirts of Lhasa during the Shoton, or ‘Yogurt,’ Festival, creating difficulties for those Tibetans attending the celebrations. Chinese authorities in Tibet’s regional capital Lhasa have deployed over 1,000 police and armed security personnel at a large monastery in the outskirts of Lhasa during the Shoton, or ‘Yogurt,’ Festival, causing hardships for Tibetans hoping to take part in the annual celebration, sources say. The security presence at the festival, traditionally held at Drepung monastery outside the city, is much heavier than in previous years, an area resident told RFA’s Tibetan Service this week. “On August 5, the day of Drepung monastery’s Shoton, Chinese authorities stationed armed police and regular police all around the monastery, unlike in previous years,” the source said, speaking on condition of anonymity. “They set up metal barricades in the monastery courtyard and are searching people thoroughly, one by one,” he said. Security personnel were also placed around a structure on a hillside behind the monastery specially built to display a large thangka, or religious scroll painting, the man said. “They have turned the whole area into something that looks like a battle zone,” he said. Another resident, also speaking on condition of anonymity, told RFA that for the first time, worshippers and security personnel appeared to be present at the festival in equal numbers. The Shoton festival began in the 17th century as a religious observance in which lay Tibetans offered yogurt to Buddhist monks who had completed their annual meditation retreats, based on a tradition dating back centuries earlier to the time of the Buddha, in India. This year’s festival will run from August 5-14 and will feature displays of religious art, photo exhibitions, bicycle races, and performances of Tibetan opera, according to Chinese media sources. Security has been especially tight in the Tibetan capital in recent years as Chinese authorities seek to restrict Tibetan assertions of cultural and religious identity amid a surge of protests, including 121 self-immolations since 2009, challenging Beijing’s rule in Tibetan areas. Photo from Radio Free Asia, courtesy of an RFA listener.